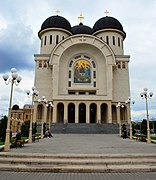 The Romanian Orthodox Church (Romanian: Biserica Ortodoxă Română) is an autocephalous Orthodox Church in full communion with other Eastern Orthodox Christian Churches, one of the nine Patriarchates in the Eastern Orthodox Church. Since 1925, the Church's Primate bears the title of Patriarch. Its jurisdiction covers the territories of Romania and Moldova, with additional dioceses for Romanians living in nearby Serbia and Hungary, as well as for diaspora communities in Central and Western Europe, North America and Oceania. Currently it is the only autocephalous Church within Orthodoxy to have a Romance language for liturgical use. The majority of Romania's population (16,367,267, or 85.9% of those for whom data were available, according to the 2011 census data), as well as some 720,000 Moldovans, belong to the Romanian Orthodox Church. 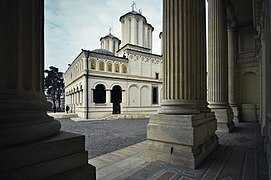 Members of the Romanian Orthodox Church sometimes refer to Orthodox Christian doctrine as Dreapta credință ("right/correct belief" or "true faith"; compare to Greek ὀρθὴ δόξα, "straight/correct belief"). The Orthodox hierarchy in the territory of modern Romania had existed within the ecclesiastical jurisdiction of the Ecumenical Patriarchate of Constantinople until 1865 when the Churches in the Romanian principalities of Moldavia and Wallachia embarked on the path of ecclesiastical independence by nominating Nifon Rusailă, Metropolitan of Ungro-Wallachia, as the first Romanian primate. Prince Alexandru Ioan Cuza, who had in 1863 carried out a mass confiscation of monastic estates in the face of stiff opposition from the Greek hierarchy in Constantinople, in 1865 pushed through a legislation that proclaimed complete independence of the Church in the Principalities from the Patriarchate. 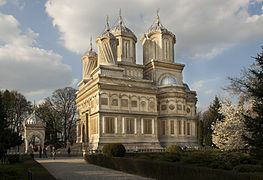 In 1872, the Orthodox churches in the principalities, the Metropolis of Ungro-Wallachia and the Metropolis of Moldavia, merged to form the Romanian Orthodox Church. Following the international recognition of the independence of the United Principalities of Moldavia and Wallachia (later Kingdom of Romania) in 1878, after a long period of negotiations with the Ecumenical Patriarchate, Patriarch Joachim IV granted recognition to the autocephalous Metropolis of Romania in 1885, which was raised to the rank of Patriarchate in 1925. Restricted access to ecclesiastical and relevant state archives makes an accurate assessment of the Romanian Orthodox Church's attitude towards the Communist regime a difficult proposition. Nevertheless, the activity of the Orthodox Church as an institution was more or less tolerated by the Marxist–Leninist atheist regime, although it was controlled through "special delegates" and its access to the public sphere was severely limited; the regime's attempts at repression generally focused on individual believers. The attitudes of the church's members, both laity and clergy, towards the communist regime, range broadly from opposition and martyrdom, to silent consent, collaboration or subservience aimed at ensuring survival. Beyond limited access to the Securitate and Party archives as well as the short time elapsed since these events unfolded, such an assessment is complicated by the particularities of each individual and situation, the understanding each had about how their own relationship with the regime could influence others and how it actually did. The Romanian Workers' Party, which assumed political power at the end of 1947, initiated mass purges that resulted in a decimation of the Orthodox hierarchy. Three archbishops died suddenly after expressing opposition to government policies, and thirteen more "uncooperative" bishops and archbishops were arrested. A May 1947 decree imposed a mandatory retirement age for clergy, thus providing authorities with a convenient way to pension off old-guard holdouts. The 4 August 1948 Law on Cults institutionalised state control over episcopal elections and packed the Holy Synod with Communist supporters. The evangelical wing of the Romanian Orthodox Church, known as the Army of the Lord, was suppressed by communist authorities in 1948. In exchange for subservience and enthusiastic support for state policies, the property rights over as many as 2,500 church buildings and other assets belonging to the (by then-outlawed) Romanian Greek-Catholic Church were transferred to the Romanian Orthodox Church; the government took charge of providing salaries for bishops and priests, as well as financial subsidies for the publication of religious books, calendars and theological journals. By weeding out the anti-communists from among the Orthodox clergy and setting up a pro-regime, secret police-infiltrated Union of Democratic Priests (1945), the party endeavoured to secure the hierarchy's cooperation. By January 1953 some 300-500 Orthodox priests were being held in concentration camps, and following Patriarch Nicodim's death in May 1948, the party succeeded in having the ostensibly docile Justinian Marina elected to succeed him. As a result of measures passed in 1947-48, the state took over the 2,300 elementary schools and 24 high schools operated by the Orthodox Church. A new campaign struck the church in 1958-62 when more than half of its remaining monasteries were closed, more than 2,000 monks were forced to take secular jobs, and about 1,500 clergy and lay activists were arrested (out of a total of up to 6,000 in the 1946-64 period). Throughout this period Patriarch Justinian took great care that his public statements met the regime's standards of political correctness and to avoid giving offence to the government; indeed the hierarchy at the time claimed that the arrests of clergy members were not due to religious persecution. The church's situation began to improve in 1962, when relations with the state suddenly thawed, an event that coincided with the beginning of Romania's pursuit of an independent foreign policy course that saw the political elite encourage nationalism as a means to strengthen its position against Soviet pressure. 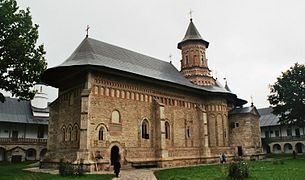 The Romanian Orthodox Church, an intensely national body that had made significant contributions to Romanian culture from the 14th century on, came to be regarded by the regime as a natural partner. As a result of this second co-optation, this time as an ally, the church entered a period of dramatic recovery. By 1975, its diocesan clergy was numbering about 12,000, and the church was already publishing by then eight high-quality theological reviews, including Ortodoxia and Studii Teologice. Orthodox clergymen consistently supported the Ceaușescu regime's foreign policy, refrained from criticizing domestic policy, and upheld the Romanian government's line against the Soviets (over Bessarabia) and the Hungarians (over Transylvania). As of 1989, two metropolitan bishops even sat in the Great National Assembly. 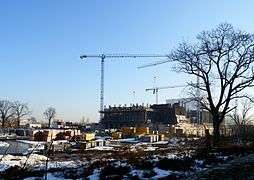 The members of the church's hierarchy and clergy remained mostly silent as some two dozen historic Bucharest churches were demolished in the 1980s, and as plans for systematization (including the destruction of village churches) were announced. A notable dissenter was Gheorghe Calciu-Dumitreasa, imprisoned for a number of years and eventually expelled from Romania in June 1985, after signing an open letter criticizing and demanding an end to the regime's violations of human rights. In an attempt to adapt to the newly created circumstances, the Orthodox Church proposed a new ecclesiology designed to justify its subservience to the state in supposedly theological terms. This so-called "Social Apostolate" doctrine, developed by Patriarch Justinian, asserted that the church owed allegiance to the secular government and should put itself at its service. This notion inflamed conservatives, who were consequently purged by Gheorghe Gheorghiu-Dej, Ceaușescu's predecessor and a friend of Justinian's. The Social Apostolate called on clerics to become active in the People's Republic, thus laying the foundation for the church's submission to and collaboration with the state. Fr. Vasilescu, an Orthodox priest, attempted to find grounds in support of the Social Apostolate doctrine in the Christian tradition, citing Augustine of Hippo, John Chrysostom, Maximus the Confessor, Origen and Tertullian. Based on this alleged grounding in tradition, Vasilescu concluded that Christians owed submission to their secular rulers as if it were the will of God. Once recalcitrants were removed from office, the remaining bishops adopted a servile attitude, endorsing Ceauşescu's concept of nation, supporting his policies, and applauding his peculiar ideas about peace. In the wake of the Romanian Revolution, the Church never admitted to having ever willingly collaborated with the regime, although several Romanian Orthodox priests have publicly admitted after 1989 that they had collaborated with and/or served as informers for the Securitate, the secret police. A prime example was Bishop Nicolae Corneanu, the Metropolitan of Banat, who admitted to his efforts on behalf of the Romanian Communist Party, and denounced activities of clerics in support of the Communists, including his own, as "the Church's [act of] prostitution with the Communist regime". In 1986, Metropolitan Antonie Plămădeală defended Ceaușescu's church demolition programme as part of the need for urbanization and modernisation in Romania. The church hierarchy refused to try to inform the international community about what was happening. Widespread dissent from religious groups in Romania did not appear until revolution was sweeping across Eastern Europe in 1989. 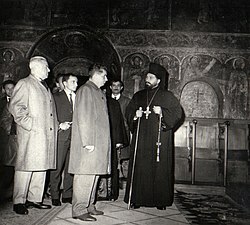 The Patriarch of the Romanian Orthodox Church Teoctist Arăpașu supported Ceaușescu up until the end of the regime, and even congratulated him after the state murdered one hundred demonstrators in Timișoara. It was not until the day before Ceaușescu's execution on 24 December 1989 that the Patriarch condemned him as "a new child-murdering Herod". Following the removal of Communism, the Patriarch resigned (only to return a few months after) and the holy synod apologised for those 'who did not have the courage of the martyrs'. As Romania made the transition to democracy, the Church was freed from most of its state control, although the State Secretariat for Religious Denominations still maintains control over a number of aspects of the church's management of property, finances and administration. The state provides funding for the church in proportion to the number of its members, based on census returns and "the religion's needs" which is considered to be an "ambiguous provision". Currently, the state provides the funds necessary for paying the salaries of priests, deacons and other prelates and the pensions of retired clergy, as well as for expenses related to lay church personnel. For the Orthodox church this is over 100 million euros for salaries, with additional millions for construction and renovation of church property. The same applies to all state-recognised religions in Romania. The state also provides support for church construction and structural maintenance, with a preferential treatment of Orthodox parishes. The state funds all the expenses of Orthodox seminaries and colleges, including teachers' and professors' salaries who, for compensation purposes, are regarded as civil servants. Since the fall of Communism, Greek-Catholic Church leaders have claimed that the Eastern Catholic community is facing a cultural and religious wipe-out: the Greek-Catholic churches are allegedly being destroyed by representatives of the Orthodox Church, whose actions are supported and accepted by the Romanian authorities. The Romanian Orthodox Church also has jurisdiction over a minority of believers in Moldova, who belong to the Metropolis of Bessarabia, as opposed to the majority, who belong to the Moldovan Orthodox Church, under the Moscow Patriarchate. In 2001 it won a landmark legal victory against the Government of Moldova at the Strasbourg-based European Court of Human Rights. This means that despite current political issues, the Metropolis of Bessarabia is now recognized as "the rightful successor" to the Metropolitan Church of Bessarabia and Hotin, which existed from 1927 until its dissolution in 1944, when its canonical territory was put under the jurisdiction of the Russian Orthodox Church's Moscow Patriarchate in 1947. The Romanian Orthodox Church is organized in the form of the Romanian Patriarchate. The highest hierarchical, canonical and dogmatical authority of the Romanian Orthodox Church is the Holy Synod. There are six Orthodox Metropolitanates and ten archbishoprics in Romania, and more than twelve thousand priests and deacons, servant fathers of ancient altars from parishes, monasteries and social centres. Almost 400 monasteries exist inside the country, staffed by some 3,500 monks and 5,000 nuns. Three Diasporan Metropolitanates and two Diasporan Bishoprics function outside Romania proper. As of 2004, there are, inside Romania, fifteen theological universities where more than ten thousand students (some of them from Bessarabia, Bukovina and Serbia benefiting from a few Romanian fellowships) currently study for a theological degree. 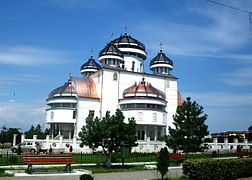 More than 14,500 churches (traditionally named "lăcașe de cult", or houses of worship) exist in Romania for the Romanian Orthodox believers. As of 2002, almost 1,000 of those were either in the process of being built or rebuilt. Canonical Eastern Orthodox autocephalous churches, including the Romanian Orthodox Church, maintain a respectful spiritual link to the Ecumenical Patriarch, currently Patriarch Bartholomew I of Constantinople. Dumitru Stăniloae (1903–1993) is considered one of the greatest Orthodox theologians of the 20th century, having written extensively in all major fields of Eastern Christian systematic theology. One of his other major achievements in theology is the 45-year-long comprehensive series on Orthodox spirituality known as the Romanian Philokalia, a collection of texts written by classical Byzantine writers, that he edited and translated from Greek. Archimandrite Cleopa Ilie (1912–1998), elder of the Sihăstria Monastery, is considered one of the most representative fathers of contemporary Romanian Orthodox monastic spirituality. Initiative of Patriarch Daniel’s, with a deep missionary impact for Church and society, has been the proclamation of jubilee and commemorative years in the Romanian Patriarchate, with solemn sessions of the Holy Synod, conferences, congresses, monastic synaxes, debates, programmes of catechesis, processions and other Church activities dedicated to the respective annual theme. The patriarchal chair is currently held by Daniel I, Archbishop of Bucharest, Metropolitan of Muntenia and Dobrudja (former Ungro-Wallachia) and Patriarch of All of the Romanian Orthodox Church. Since 1776, the Metropolitan of Ungro-Wallachia has been titular bishop of Caesarea in Cappadocia (Locțiitor al tronului Cezareei Capadociei), an honor bestowed by Ecumenical Patriarch Sophronius II. ^ a b c d e Reichel, Walter; Eder, Thomas (2011). "Religions in Austria". Federal Press Service. Vienna: Federal Chancery, Federal Press Service. p. 25. Retrieved 2 July 2013. ^ Krindatch, Alexei (2011). Atlas of American Orthodox Christian Churches. Brookline, MA: Holy Cross Orthodox Press. p. 143. ISBN 978-1-935317-23-4. ^ Presidential Commission for the Study of the Communist Dictatorship in Romania, pp. 446-447 (2006). "Raport final" (PDF) (in Romanian). Romanian Presidency. ^ Mihail Neamțu (2007-10-17). "Despărțirea apelor: Biserica și Securitatea" (in Romanian). Revista 22. ^ Presidential Commission for the Study of the Communist Dictatorship in Romania, p. 453 (2006). "Raport final" (PDF) (in Romanian). Romanian Presidency. ^ Presidential Commission for the Study of the Communist Dictatorship in Romania, pp. 455-56 (2006). "Raport final" (PDF) (in Romanian). Romanian Presidency. ^ See George Enache. "Biserica Ortodoxă Română și Securitatea" (in Romanian). Ziua. ^ a b Ramet, Pedro and Ramet, Sabrina P. Religion and Nationalism in Soviet and East European Politics, p.19-20. Duke University Press (1989), ISBN 0-8223-0891-6. ^ a b c Lavinia Stan and Lucian Turcescu, Religion and Politics in Post-communist Romania, Oxford University Press, 2007. ISBN 0-19-530853-0. ^ Maclear, J. F. (1995). Church and State in the Modern Age: A Documentary History. Oxford University Press. p. 485. ISBN 9780195086812. Though Romania's Uniates and The Lord's Army—the evangelical wing of Romanian Orthodoxy—were suppressed in 1948 and other religious groups experienced persecution during the late 1950s and early 1960s, Romania relaxed tensions during the 1970s and acquired a reputation in the West for successful management of religion without marked ruthlessness or violence. ^ a b c Sabrina P. Ramet, "Church and State in Romania before and after 1989", in Carey, Henry F. Romania Since 1989: Politics, Economics, and Society, p.278. 2004, Lexington Books, ISBN 0-7391-0592-2. ^ a b Ramet 1989, p.20. ^ Ramet 2004, p. 279. ^ "International Religious Freedom - Embassy of the United States Bucharest, Romania". Archived from the original on 6 October 2014. Retrieved 5 March 2015. 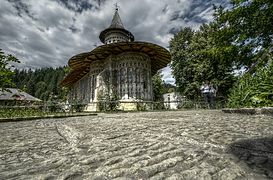 ^ "BBC News - Romania's costly passion for building churches". BBC News. Retrieved 5 March 2015. ^ "The Romanian Greek-Catholic Community is facing a cultural and religious wipe-out – letter to US Secretary of State Hillary Clinton". HotNewsRo. Retrieved 5 March 2015. ^ Electronic version of Dicționarul teologilor români (Dictionary of Romanian Theologians), Univers Enciclopedic Ed., Bucharest, 1996, retrieved from http://biserica.org/WhosWho/DTR/I/IlieCleopa.html. 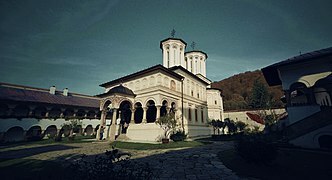 Wikimedia Commons has media related to Romanian Orthodox Church.